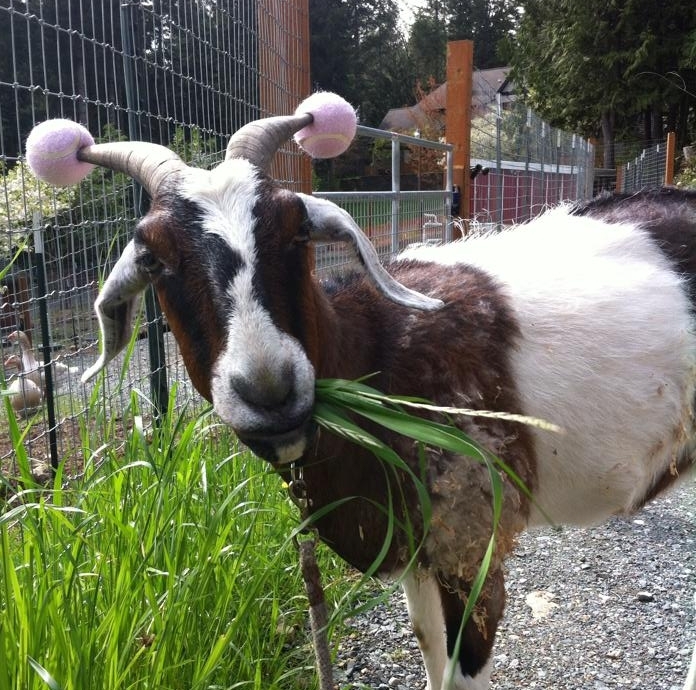 Our story begins with a big, goofy, sassy, 3-legged Boer goat named Trippy. When I first met Trippy he had already spent a year at the sanctuary. He had come in as part of a neglect case with a number of other goats. He suffered from severe malnutrition. After a few months of medical treatment and a steady diet, Trippy went up for adoption. Prior to coming to the sanctuary, Trippy was found on the side of the road with barbed wire wrapped around his leg. Due to lack of blood and infection, the lower leg could not be saved. He made it through surgery but unfortunately he developed another infection in the leg and had to have the top portion of his leg amputated. True to his nature, he didn’t let it get him down and he was up and moving in no time. We cannot explain why it took so long for Trippy to be adopted but I’m convinced it is because he was meant to be with us. It took us almost a year to find the perfect property for Trippy. It couldn’t be too steep or wet for him. We finally found it and amply named our new home the “Wobbly Ranch.” We wanted to create a home for all of the animals that are just a little wobbly. Unfortunately Trippy only spent about 6 months in his forever home. For unknown reasons, he developed an infection in the joint in his front leg. We explored every option for our King, however the infection just destroyed the joint. On September 5, 2016 surrounded by love, we said goodbye to him but his legacy will live on. He will forever be the King of the Wobbly Ranch.